In February of 2013 we saw Lenox' face for the first time. Just a week later we began the process to adopt him. 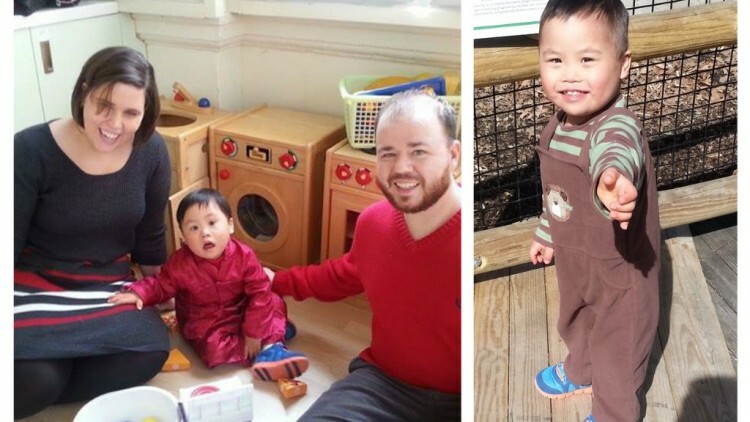 The process of adoption from Hong Kong is long but on February 16, 2015, we arrived home with Lenox! Lenox is a joy and we are so happy that he is ours. However, since arriving home, Lenox has had multiple health problems which we were not expecting. In addition to rising medical costs, we still owe toward our adoption fees. Most recently we learned that Lenox will be in need of a liver transplant in the future and will need to participate in a clinical drug trial. We are told that without these steps, Lenox will not see his 12th birthday. The financial toll all of this has taken on our family has been great. Due to Lenox' needs, I (his mom) have not been able to return to work. We appreciate your support in helping with adoption costs so that we can focus our finances on medical needs. I havent updated in a bit, it has been a whirlwind lately. Lenox was tested for the trial and the bloodwork came back that he could participate. We are now on our third try to get him to lay still for a Dexa scan. We only have till the 22nd to get this achieved or he is out of the trial for good. He liver counts are almost doubling each time they are drawn so this is major! We also saw the feeding team and they want him to have a G tube placed stat. The referal was put in Wednesday, I called today ( Thursday) and we go tomorrow to have our consult. He is doing more lung damage due to the aspiration and I was told that he would more than likely end up in the ICU before the end of winter if we didnt do this now. They also added feeding therapy to our schedule making our numbee of therapy appointments a week 8. We are still awaiting the equipment that he has been measured for and praying that the insurance will pay 100%. We are needing well over $10,000 in equipment to make him comfortable. We are pleased to say that Lenox passed both his hearing and eye exam with flying colors so thats a huge blessing. I will update again tomorrow about the surgery dates and dexa scan progress. So we recieved a phone call yesterday that they had reviewed Lenoxs medical records and feel he isnt a candidate any longer for the trial study. I have begged and pleaded for them to reconsider and will hear back by Friday the final decision. This is all happening because 1 Dr. treats all her adoptive patients the same saying they have TB and need to be treated. We refused to treat the "imaginary" TB and it didnt go her way so now we have issues. Im hoping they take into consideration that they have a over 6 clear chest xrays to confirm he doesnt have TB along with several other Dr. And nurses statements confirming the same. We have to be in this trial!! Lenox also started a new Physical Therapy and Occupational Therapy program yesterday. He loved it there and Im betting he will be stronger in no time with these great therapist working with him. I believe we will be getting orthopedic braces to help with the weakness that comes and goes so that should be interesting. Over all he is doing well this week and has loved swimming some. He is such an incredible kiddo! Now we are battling low body temps. In the last 4 days we have went from 104.0-95.0. Again we were told its all due to the liver issues. He is also unable to stand or really wobbly at times. All we can do is treat the pain with motrin for now. We see a new Physical therapist Monday and will probably be getting so orthopedic braces soon to helo in times like that. I forgot to mention we are scheduled for our first trial appointment and bloodwork on July 17th. That seems forever away right now! Lenox ended up in the ER this weekend due to a very high fever and joint pain. The blood work was all good beside his liver function tests. They had came up 2 points already since he was last tested. So we went the pediatrician today and she said this was just something thats going to happen. Its a "flare up" which is causing an auto immune response in his joints and a high fever. We were supposed to go Cincinnati for his surgery consult for his G tube. We had to cancel due to the fever so hopefully they can reschedule soon. He has 4 different surgeries on June 24Th and I was hoping they could do it at the same time. We will update soon. We recieved some answers back from tge trial Dr. and have decided to move forward with his trial ASAP. We are currently waiting on the trial Dr. to answer questions we have and then we will be starting the trial sometime in the next 2 weeks. We are praying for your sweet family! Praying for your family and sweet little boy. God bless! Prayers for wisdom, favor, and healing.